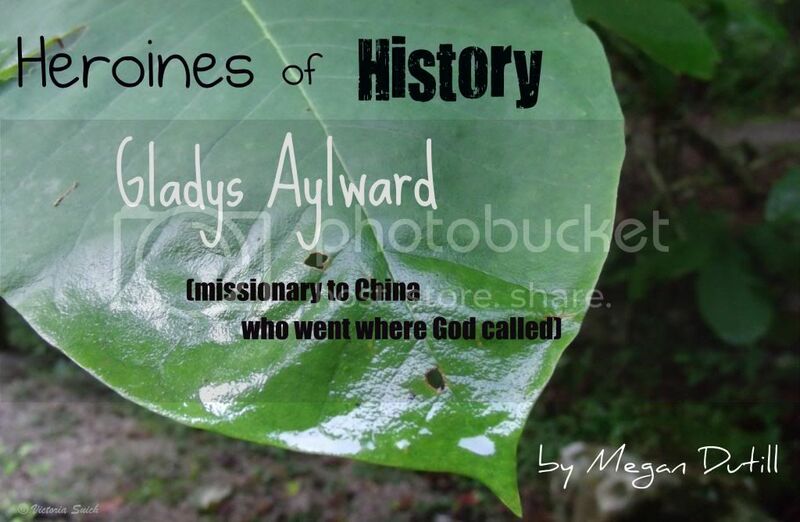 Meet Gladys Aylward: a little woman with a big story and an even bigger God. “But when at last she reached the country to which God had called her to be a missionary, she stood on the wharf in Shanghai and looked around at the people to whom he had called her. ‘Every single one of them,’ she said, ‘had black hair. And every single one of them had stopped growing when I did.' And I said, ‘Lord God, You know what You’re doing!’” (Let Me Be a Woman, 32). Not only did God give her physical features to help her acceptance in China, but he gave her the faith and courage to actually journey there. Gladys was born in 1902 to a working-class family in London. She worked as a housekeeper until, at 28, she felt the call to go to China and applied to the China Inland Mission. In faith, she determined to go on her own. Gladys saved money and, in 1932, bought a one-way train ticket to China; a difficult journey that involved being kicked off the train and walking in the Siberian winter. At first, she supported missionary Jeannie Lawson and operated an inn for mule drivers. After Lawson’s death, she could no longer afford the inn, but had made such an impact on the people that the government asked her to become a “foot inspector,” a position that required her to travel and visit with women, checking to see if their feet were still being bound (a practice then illegal in China, but frequently performed). She used this opportunity to become a traveling missionary, telling Bible stories wherever she went. So she went in, and the rioting convicts listened to her. She lobbied for them to have more food and actual work opportunities, both of which were granted. She gradually began adopting children – young beggers and war orphans – at one point taking care of 200 of them. When war struck, she took them all to safety. Because of Gladys, government officials became Christians, starving children were given a new chance at life, women who couldn’t travel far heard the gospel, prisoners were given better conditions and ultimately set free and a church was founded in Sian. But what really sets her apart? Her faith in an extraordinary God, and her willingness to do whatever he asked. "I wasn't God's first choice for what I've done for China,” she has said. “I don't know who it was…It must have been a man…a well-educated man. I don't know what happened. Perhaps he died. Perhaps he wasn't willing…and God looked down…and saw Gladys Aylward…And God said - "Well, she's willing."